While faux furs and micro fleece blankets are a solid choice for the cold-footed people of the world, nothing beats the beauty and elegance of a beautiful wool or classic cotton throw. The Eleanor Pritchard throw from School House Electric. Photo via School House Electric. 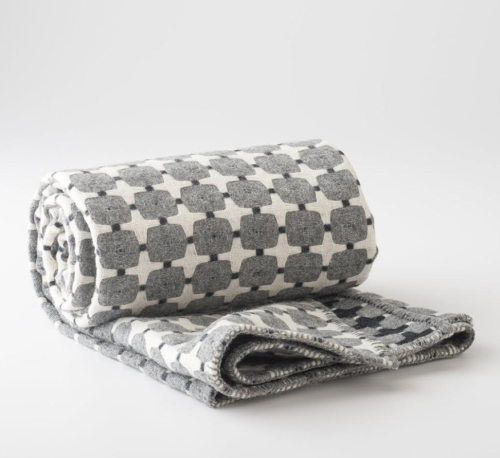 The Eleanor Pritchard Throw from School House Electric is definitely a splurge at $389, but the print alone makes it worth your consideration. The size is just right to keep you warm on a cold winter’s night and the pattern completely elevates your blanket game. The Vermillion Wool Throw from Fairbault Mill is a more subtle geometric, sure, but what it lacks in print it makes up for in price. At $180 per blanket, you can buy one in each color! And let’s be honest… sharing a blanket is a non-starter. I get it. You have a dog and kids and who has time to get to the dry cleaners to launder a blanket? If you prefer the ease of cotton to the fussiness of wool, look no further than this fabulous print found at Salt and Sundry. The Gold + Black Triangles Recycled Cotton Throw is a bold pattern disguised as an elegant neutral in classic black and gold. I like to call it the Midge Maisel of blankets! Finally, if classic comfort is your thing, look no further than the timeless classic Antiochia Throw at Eastern Market. Stop by Antiochia today and get 20 percent off your purchase. What’s your favorite resource for cotton or wool blankets? Kyra DeBlaker-Gebhard is a decorator and owner of First District Designs.